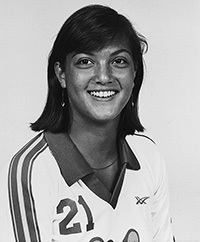 Liz Masakayn led Santa Monica HS to the CIF Title, then went to UCLA and led Bruins to their first NCAA title in 1984 with a NCAA record 32 kills including match point in the championship win. She won the 1984 Honda Award as nation’s top college volleyball player and the 1985-86 All-University award at UCLA’s top female student-athlete. She was a three-time Collegiate All- American who also played in 1983 NCAA finals and 1985 NCAA Volley Four. She left UCLA as the all-time leader in kills and service aces; then went to the USA National Team and started at outside hitter for the 1988 Seoul Olympics. She then turned to coaching and helped UCLA to the 1990 & 1991 NCAA titles and 1992 NCAA runner-up as an Assistant to 2017 SCIVBHOF member Andy Banachowski. Selected as one of the 25 greatest players in UCLA history, Liz is a member of AVCA College VB HOF. The 5-8 hitter was voted to the NCAAs first All-Decade Team in the 1980s. She went onto great beach career after retiring indoors and just missed making the 2000 Beach Olympics in Sydney with Elaine Youngs. She finished as one of the best beach players of all-time by winning 47 tournaments in her career and was also a successful beach coach for many years for both AVP and youth players. She is in the California Beach HOF.